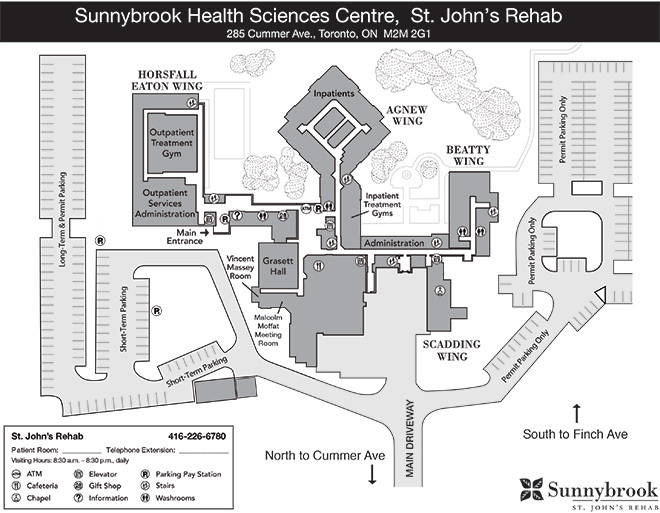 St. John's Rehab is located at 285 Cummer Avenue, Toronto. Our phone number is 416-226-6780. 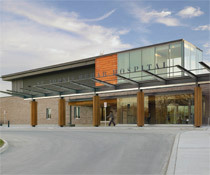 Please note: There is no emergency department at St. John's Rehab. 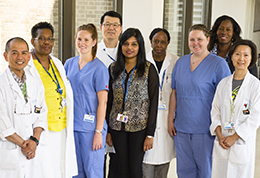 Sunnybrook's emergency department is located at our Bayview Campus at 2075 Bayview Avenue. In case of emergency, call 911. The Toronto Transit Commission bus #42 departs from Finch subway station and drops off passengers at the end of the hospital driveway. We are situated between Bayview Ave. and Yonge St., north of Finch Avenue and south of Steeles Avenue in the Willowdale community. Parking for patients and visitors is located near the main entrance, or in our permit lots if applicable. 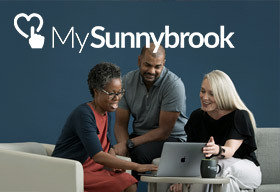 Sunnybrook has implemented a new selection of discounted parking packages to align with the Ministry of Health and Long-Term Care's steps to make hospital parking more affordable for patients, their loved ones and caregivers. Pay-per-use parking packages are available for patients, their family members and visitors who frequently visit the hospital. All passes include in-and-out privileges for a 24-hour period, and are usable any time for both consecutive and non-consecutive days. 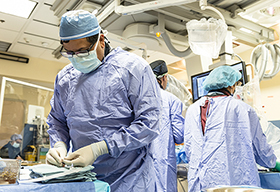 Passes are transferrable between a patient and their family member(s), their visitors/caregivers and their vehicles, for use by one vehicle per entry/exit. Passes expire one year from purchase date. Patients and visitors can purchase pay-per-use passes through the Parking and Transportation Services Office, St. John’s Rehab, B119 (Beatty Wing, Room 1st floor, Room 119). Your feedback is important to us. 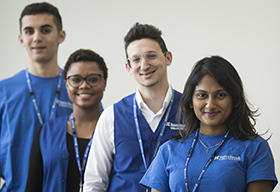 If you have any questions or comments about our pay-per-use parking passes, please connect with us directly at 416-226-6780 ext. 7339. Visitors must pay for their parking before entering the building by using the Pay by Licence Plate machines located near the parking spaces in front of the main entrance. These machines accept coins, MasterCard and Visa. Visitors may also enter the permit lot on the east side of the campus toward the main entrance by taking a ticket. Visitors must pay for their parking ticket at the pay station located inside the hospital in the main lobby before exiting. Location: B119 (Beatty Wing, Room 1st floor, Room 119). Hours: Monday to Friday: 9:00 a.m. to 5:00 p.m.